The government has to take resources from someone before it can dole them out to others. Actually, no. To believe this is to misunderstand the very nature of governance. Those who are governed like to believe that their government exists to serve them, and all political leaders are quick to encourage this perception. However, amongst themselves, political leaders fully understand that they exist primarily to feed off of and dominate the electorate. Of course, they can’t actually admit this, but, regardless of party affiliation, that is their very raison d’tre. Why should this be so? Because no one thinks of himself as being amongst “the greedy rich.” For the man who is worth $1,000, the greedy rich are those who are worth $10,000 or more. But, likewise, the man worth $100 thinks of the greedy rich as those worth $1,000 or more. Human nature dictates that we don’t see ourselves as greedy, but it’s not too difficult for politicians to convince us that those who have more than us are greedy. Further, once we’re convinced of this, it’s not too difficult to fool us into believing that the greedy rich have, in some way, achieved this wealth by swindling us out of it. And, now that you mention it, yes, we would like to have some of it back, thank you. And so, it’s the nature of governments (whether they claim to be conservative or liberal) to seek to increase the size of government annually (requiring ever-more revenue to pass through their hands) and to take an ever-greater part in the hands-on distribution of the nation’s wealth. All governments will do all they can to grow themselves, as it’s very much in their interest to do so. 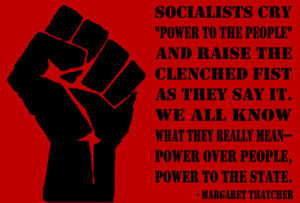 All governments will, regardless of their party rhetoric, continually pursue a greater level of socialistic policies. In this regard, political parties are interchangeable. The choice, really, is whether the individual is living in a jurisdiction where he believes the government has already become so socialistic that he’s a net loser, rather than a net recipient. Beyond this point, his future can only be on a downward trajectory. Socialism often leads to economic and societal collapse, hyperinflation, shortages, and shrinking personal freedom.